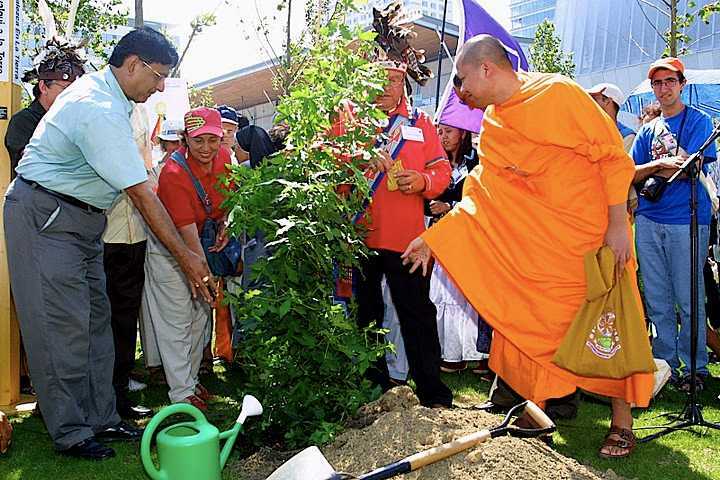 I had a chance to answer those questions in June of 2004 when I attended the largest interfaith global conference in the world, convened by the Council for a Parliament of the World’s Religions. I hadn’t known about the work of the Parliament until a friend of mine sent me an email suggesting I submit my film God and Allah Need to Talk as a potential program at the upcoming Parliament in Barcelona. I applied and to my delight was informed my workshop proposal was one of 350 chosen from among 1,500 proposals submitted. I would be able to screen my film and present an interactive interfaith program like those I had taken to university campuses, but now at a world forum. My excitement at going to Barcelona was contagious. Three friends joined me: Thomas Hedberg and Rebecca Tobias, interfaith colleagues, and Stefani Valdez, an talented musician and singer who had agreed to perform for the workshop. We brainstormed financing the trip, deciding to take advantage of our frequent flyer miles and to apply for the “home stay” option offered by the Parliament. Rebecca and I were invited to stay with a hospitable Spanish widow. Stefani stayed with a local musician friend of hers. And Thomas found lodging in a Catholic monastery. We arrived in Barcelona to discover we would be sharing our Parliament experience with more than 9,000 people from 85 countries. People from around the world arrived in their colorful native dress, representing every religion I had heard of and some that we new to me – a community speaking a symphony of languages. A feeling of euphoria took over. Paradise would look like and taste like this, I thought: people of good will on a pilgrimage of discovery, meeting and greeting one another with respect, curiosity, and an openness to observe and share religious practices, to discuss our differences without making excuses for having differences, and to confront the most urgent problems of the globe with the understanding that these were collective problems that deserve collective solutions. The menu of daily activities of spiritual practices, seminars, workshops, lectures, panel discussions, and plenaries was so appetizing, I often found myself torn between five offerings. It wasn’t all easy. Panels and seminars took on challenging issues. Scholars, clergy, laypeople and young people reflecting on the cause of violence in religion, on the brewing ecological crisis, on national debt, the worldwide refugee problem, and other issues of the day. A special two-day seminar explored innovative peace practices being implemented by courageous Israeli and Palestinian peace workers in Jerusalem confronting what seems to be an intractable political issue. Hour after hour Sufi sheikhs, rabbis, imams, male and female peacemakers held heart-to-heart talks about their struggle to transform their world-at-war. By the end of the extended seminar they had a clearer idea about the conflict, but unfortunately we were no closer to coming up with a solution. In one of the daily plenary sessions, Ammaji, known as “the hugging mother,” was invited to give the keynote speech. Suddenly in the middle of her talk, the simultaneous translation to Spanish, Catalan, and English failed. The teleprompter froze, but no one seemed to mind. I realized that her talk in her native Malayalam was not what people were responding to. It was her presence and her compassion which poured out into the audience like a stream of fragrant flowers, needing no translation. That night Ammaji continued to give her world-famous hugs. 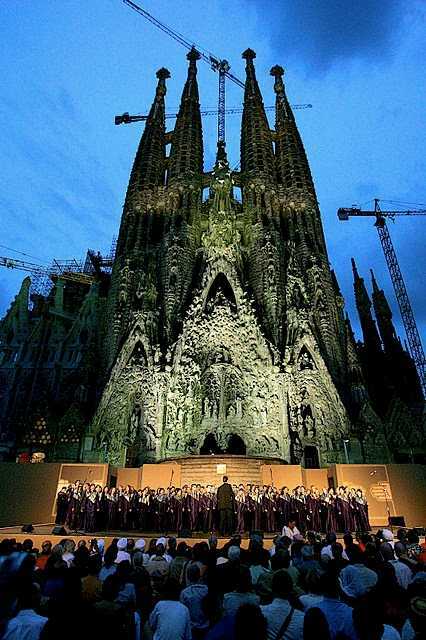 The climax of the Barcelona Parliament was the musical concert held outside of the famous Gaudi-designed church, La Familia Sagrada, featuring artistic performances and religious observances from all over the world. It was an audio-visual feast that even now, seven years later, is hard to describe. The variety and beauty of the evening’s events, lasting for three hours, included Native American invocations, operatic arias from Italy, Taiko drummers from Japan, whirling dervishes from Turkey, Hindu monks from India, dancers from China, and a finale orchestrated by a contemporary religious rock group from Israel that brought over six thousand people to their feet. Long into the night the exhilarated crowd continued to applaud and marvel as they were absorbed in a glorious crescendo of music, religious devotion, dancing, and interfaith celebration in the streets of Barcelona. One aspect of the Barcelona Parliament proved to be the most visceral, tactile experience of all. The Sikh community of Birmingham, England, led by Bhai Sahib Mohinder Singh, decided to demonstrate one of their most sacred religious principles: hospitality and feeding people. They rented a large area, the size of an airplane hanger, walking distance from the Parliament venue, laid out red carpeting, set up a kitchen and a Sikh gurdwara (place to worship). Two large circus tents housed their “langar,” a Sikh term meaning free food, served in a gurdwara. For six days, twice a day, the Sikhs served savory vegetarian meals for four to five thousand people at the Barcelona Parliament. At the start of the conference, the Sikhs from Birmingham located a local vegetable store near the Forum. For three days, they bought out the entire stock of produce. The owner was gratified to sell all of his merchandise but puzzled about the huge quantities they were buying all at once. On the fourth day when the Sikhs arrived to make their purchases, they were told by the merchant they could no longer purchase anything. Stunned, they asked him to explain. Sectarianism, bigotry, and its horrible descendant, fanaticism, have long possessed this beautiful Earth. They have filled the earth with violence, drenched it often with human blood, destroyed civilization, and sent whole nations to despair. Had it not been for these horrible demons, human society would be far more advanced than it is now. But their time is come; and I fervently hope that the bell that tolled this morning in honor of this convention may be the death-knell of all fanaticism, of all persecutions with the sword or with the pen, and of all uncharitable feelings between persons wending their way to the same goal. We have not heard the death-knell of fanaticism yet, Swami-ji, but your words keep inspiring us to keep seeking an interfaith paradise.